Series returns to Copper Mountain this weekend. The event includes a weekend of free fat bike demos and a cross country race Saturday night. For the second week in a row, mountain biking returns to Summit County, with Copper Mountain Resort’s fourth annual WinterBike fat bike night race Saturday, Jan. 24. The event is part of two days of free fat bike demos at the resort. It is also the first race in the Leadville Winter Bike series. Proceeds from the race benefit the Cloud City Wheelers — the Leadville chapter of the International Mountain Bicycling Association (IMBA) ­— and Lake County trail building projects­. The event typically attracts around 150 riders of all ages and abilities. The full-length race starts at 6:15 p.m. on a two-lap, 12- to 15-mile course through Copper’s Center and East villages and on the resort’s Nordic ski trail system. Portions of the course also incorporate sections of the mountain’s alpine trails. He said last year that even included a bit of carnage as riders lost it on some of the downhill sections. The $20 race registration fee goes to the Cloud City Wheelers biking association. Registration is available on the day of the event in Center Village starting at 3 p.m. There will also be a short kids’ race, LittleBike, through Center Village starting at 4:30 p.m. for kids 9 and younger. New this year, organizers added JuniorBike, a race for youths ages 10 and older. The JuniorBike course will be a shortened version of the full course and will incorporate some of the Nordic trails. Guests and participants are encouraged to stick around for postrace fireworks and an after-party at the Incline restaurant and bar. Already popular in other parts of the country, fat-tire biking — wintertime riding on bikes with roughly 4-inch-wide tires — continues to grow in Colorado. 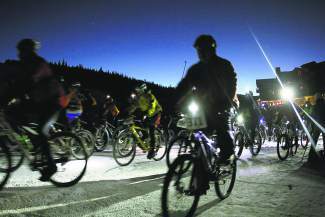 Last week Breckenridge’s annual Ullr Fest winter celebration added Ullr Bike, another nighttime fat bike race that took place on Breckenridge’s Gold Run Nordic Center trails. His first-year event saw roughly 75 participants with even more showing for free demos. “At one point all the demos were out,” Westcott said, calling the event a success. A number of Summit County area rental shops — including Wilderness Sports and Rebel Sports in Frisco — added fat bikes to their rental lineup last season. The bikes feature 4-inch-wide balloon tires — roughly twice the size of standard mountain bike tires — made to push through snowy or muddy conditions. Those interested can demo fat bikes all day Saturday and Sunday in the Burning Stones Plaza at Copper’s Center Village. Fat bike demos will be available on a first-come, first-served basis for the race itself. Regular mountain bikes can also be used for the race.